Want to tell your Mac what to do? Wish granted. Now you can with the #1 voice recognition software out on the market. Tell your computer to open your email and write an email to Big Foot and that's what it will do. Need to draft up an email for work? Or write a paper for school? Don't bother typing it because Dragon Dictate will help you get it done in lightning speed. Just read your text aloud and watch the magic appear before your eyes right on your computer screen. 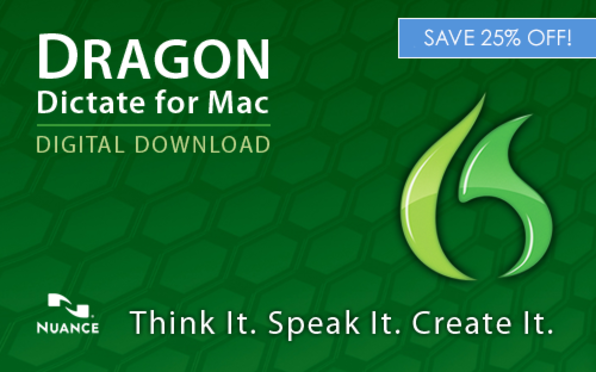 With Dragon Dictate you can use your voice to create and edit text or interact with your favorite Mac applications. You can even use a digital voice recorder and Dragon will transcribe your dictation when you are back at your Mac. With the digital version you'll be able to use your Mac's built-in mic or an external mic to help you deliver demands to your Mac. Please note: the digital version doesn't include an external USB headset but the Boxed version (shipping costs $9.95) does. Click HERE to buy the boxed version.